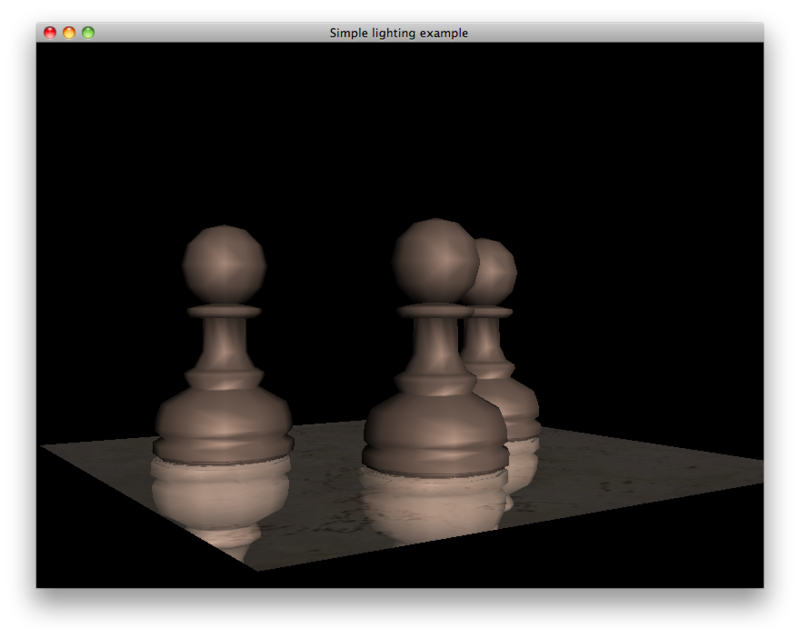 This render component implementation traverses a scene drawing lines from parents to each of its children. 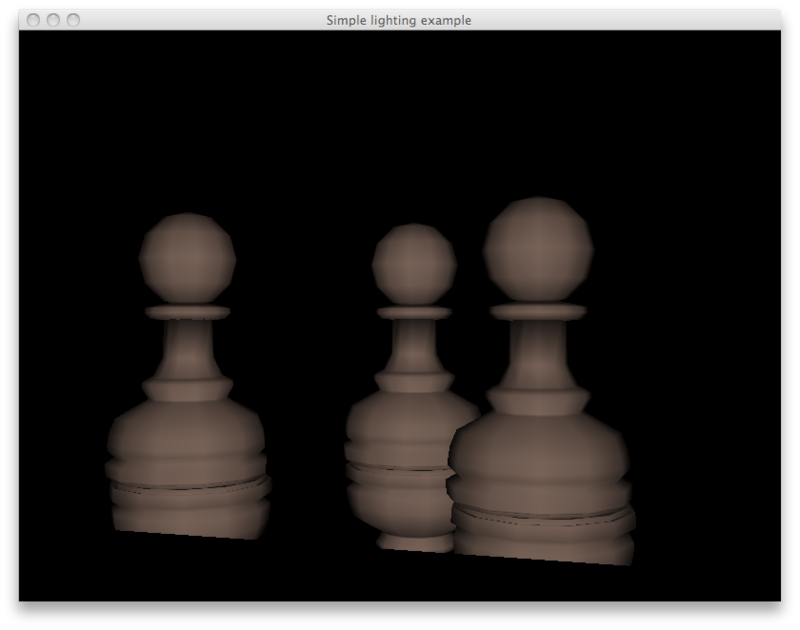 It requires a shader program to draw the lines, but it can be customized as much as needed. 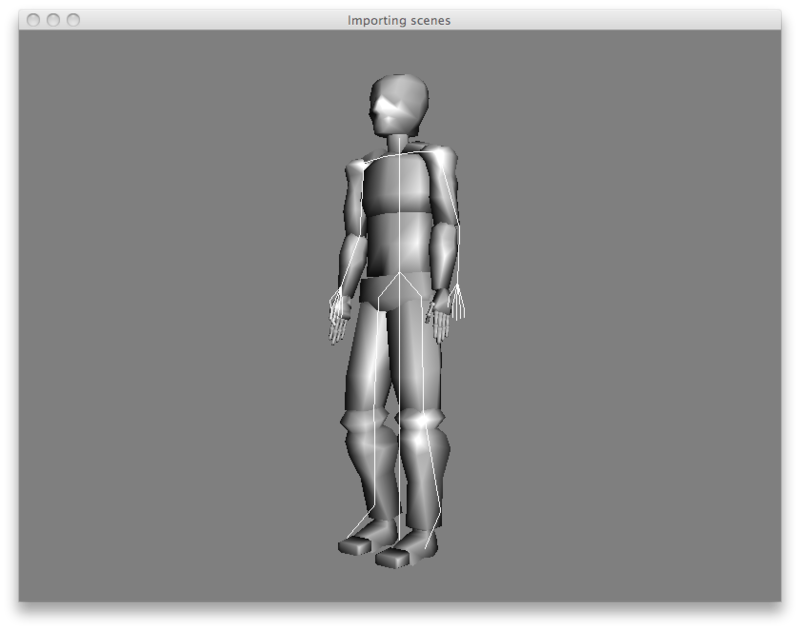 For example, I’m working on a version of the shader using different point size for the joints between bones that will be available soon. This class is particularly useful to find out which nodes are redundant and can be eliminated. 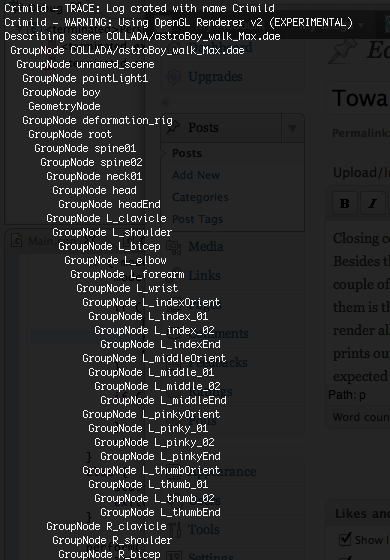 For example, a GroupNode with only one child and no transformations applied it’s hardly useful and can be completely avoided. Both of this classes are part of the new Crimild::Debug namespace. My intention is to create as many of this utility classes as needed in order to provide a reusable debugging library for any Crimild-based project. 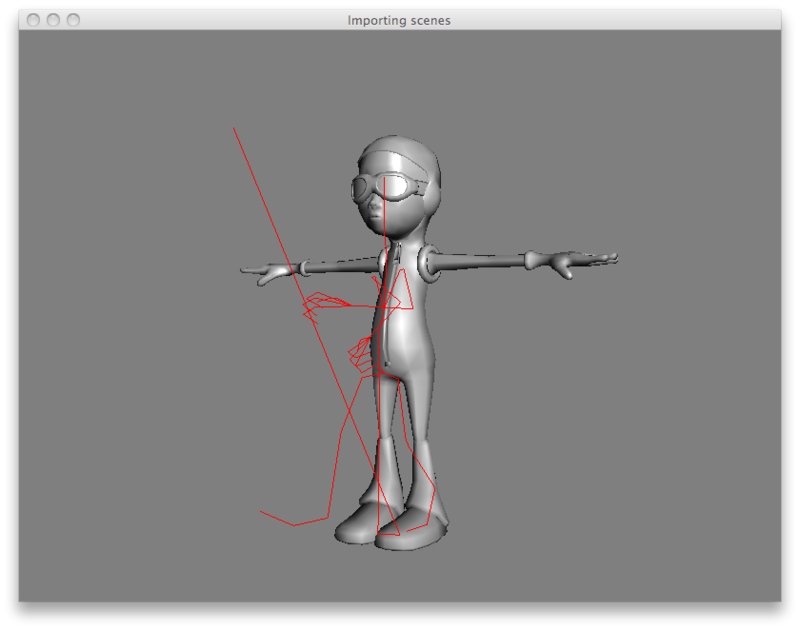 After reading a lot about the subject, I finally started my crusade to add skeletal animation support on Crimild. It’s going to be a behemoth task, so this will be the first post of many about the subject. But before performing skeletal animations we need to have something to animate, right? The COLLADA file format specification seems to be the best choice once again. It successfully manages to store animated models with all of their complexities in a standard file format regardless of the tool used to create them. The model is one of the many example files in the COLLADA Test Model Bank. In the image you can see the skin as well as several white lines that indicates the presence of a skeleton. Of course, the skeleton is drawn just for debugging purposes. One thing that keeps bothering me is that the COLLADA importer is getting bigger and bigger in each iteration, making it difficult to maintain (even for me). So I guess I’m gonna have to do some major code review there in the near future. Stay tuned to know more about skeletal animation support in Crimild. 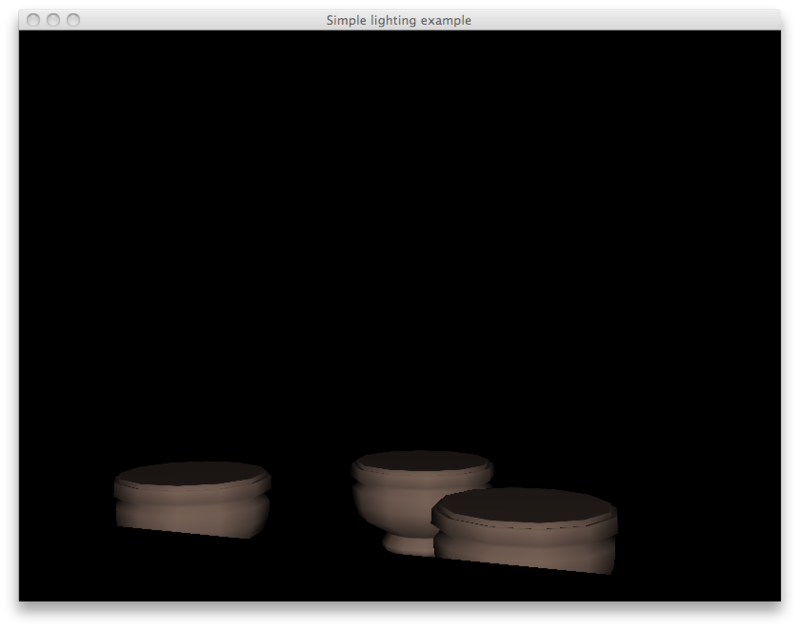 Long story short, I’m using a custom render component that creates a reflection of a given scene in four steps. The first step is to render the base plane (the one that will be used to reflect the scene) into the stencil buffer. Then, we render the reflected scene using the stencil buffer information to clip those portions of the reflection that lie outside of the base plane. The reflection illusion is created by rendering the scene upside-down. 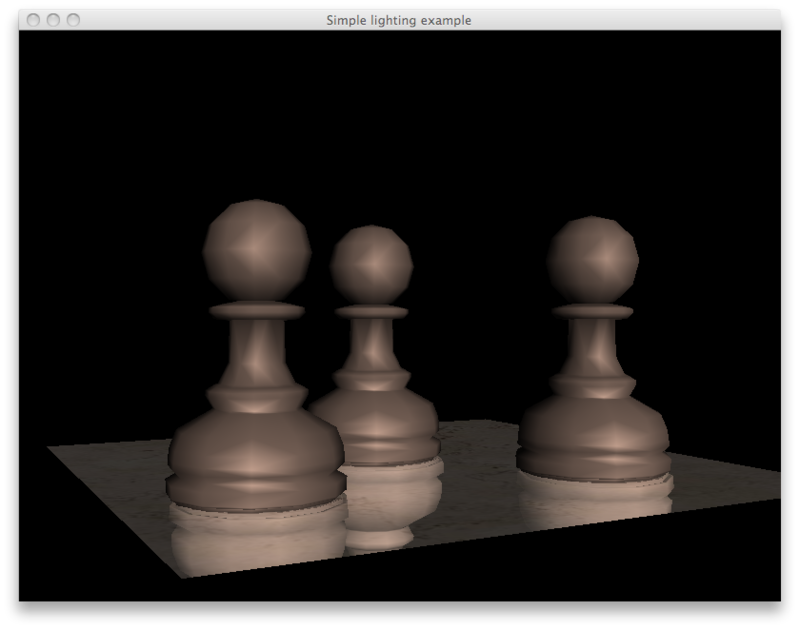 The last step is to render the base plane again, this time enabling textures and lighting. In addition, we’re going to use forward-to-back blending, creating the illusion of a polished surface and producing the final effect. The source code for this example can be found in the examples/Reflections directory. The custom render component used in this example is not as generic as I would like it to be, but it can be easily modified to suite any scene if required.